Auto repairs can be nightmare, especially when it comes to tire failure. A flat tire will add an unwelcome delay to your day even if you have roadside assistance. If you don’t, then a flat tire could completely ruin your day. Most of us are so busy these days that we don’t feel like we have the time to keep up with the proper maintenance of our vehicles, even though in the long run that could mean losing our car to the mechanic for a day or two of auto service. Relax. You are about to learn some very easy steps that you can take to both extend the life of your tires and get the most miles out of your gas tank. Proper tire inflation is the key. Every tire has a recommended PSI rating, or the air pressure that it should be inflated to, printed on the sidewall of the tire. 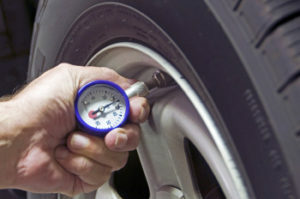 Keeping your tires inflated to this pressure will ensure that the car will run safely, as well as more economically. The car will run more efficiently, i.e. use less gas, because low tire pressures increase the coefficient of friction and make the car work harder to achieve the same speed. Another tire-related maintenance task that is often avoided by car owners is tire rotation and balancing. The main reason to balance and rotate your tires is a smooth even ride, but there are other benefits as well. As you drive your car small events can occur, like hitting a pothole or running over a curb, and you don’t think twice about them. These small events can work together over time to make your car’s ride and handling rough and unstable. The worst of it is this, you might not even really feel anything but a small shake, but it is costing you more money every time you fill the gas tank and ignore the problem. Owners probably avoid rotating and balancing their tires because they haven’t found a trustworthy service center where the mechanics only charge for the necessary repairs. If you’re looking such a mechanic, come visit Lament’s Auto Repair in Wayne Pennsylvania. Our experienced technicians are familiar with all aspects of auto service, wheel and tire maintenance.